Marijuana stocks rocketed higher on Wednesday thanks to Attorney General Jeff Session's resignation. Aurora Cannabis (NYSE:ACB) stock declined 29.2% in October, according to data from S&P Global Market Intelligence. But it's already up 18.8% in November, thanks largely to a 9.2% jump on Wednesday. For those new to marijuana stocks, Aurora is one of the largest Canadian cannabis growers. We can attribute Aurora Cannabis stock's drop last month to marijuana stocks in general taking a hit. With few exceptions (such as MariMed, which rose 19%), stock prices in the sector pulled back notably last month after running up big-time during the late summer in anticipation of Oct. 17, when marijuana became legal for adult recreational use in Canada. Aurora stock's strong start to November is largely thanks to Jeff Sessions' "resignation." By all accounts, the U.S. attorney general, who had a publicly difficult relationship with President Trump, was forced out. This news came out starting at 2:44 p.m. EST (11:44 a.m. PST) on Wednesday via two Trump tweets, after which Aurora stock took off, as the chart below shows. Sessions is anti-marijuana to the point that it was feared that he might crack down on the possession and/or use of the substance in the U.S. states where it's legal for medical and/or recreational use. As U.S. attorney general, he had he the power to do so because marijuana remains illegal on a federal level. Aurora Cannabis stock chart for Wednesday, Nov. 7, 2018. Time of Trump's first Sessions'-related tweet indicated on chart. Image source: Yahoo! Finance. It's actually a bit surprising to see how much marijuana stocks partied like it was 1999, because the news about Sessions wasn't entirely unexpected. Many believed Trump would give him the boot after Tuesday's midterm elections. The midterms (in which the Republicans kept control of the Senate and lost control of the House) also brought some good news to the cannabis sector. Michigan became the 10th state (along with Washington, D.C.) to legalize adult recreational use, Missouri legalized medical marijuana, and Utah legalized the substance for people with qualifying illnesses. Certainly, the new about Jeff Sessions removes at least one major perceived barrier for the marijuana legalization movement in the U.S. This is not only good news for U.S.-based cannabis players, but also those in Canada, such as Aurora, which are surely eyeing entering their big neighbor to the south once they're legally allowed to do so. As for Aurora, investors should keep their eyes on the Canadian recreational marijuana market launch, as a stronger-than-expected roll-out could boost its stock. Same goes for the announcement of any partnerships with big companies, as there's been market chatter that a big player in the soft drink, alcoholic beverage, or tobacco space might want to team up with the company. 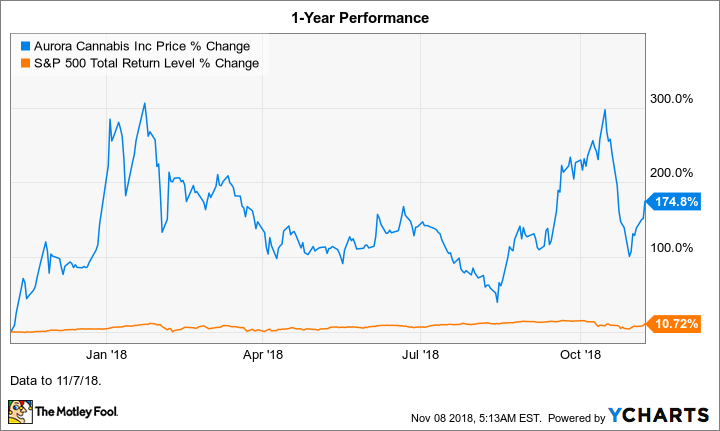 Like all of the pure-play marijuana stocks, Aurora Cannabis remains a stock best suited for investors comfortable with a high degree of risk.